I remember flipping open the cover of Cities of Death for the first time and seeing this beauty here. Talk about a great piece of terrain. I decided right then and there that I would build it one day. Maybe not the exact same thing, but something close... something huge that would almost cover an entire table on it's own. Now we were talking. And like everything else, I let the idea simmer for the longest time. And then one day, after getting a hold of the perfect baseboard, I set out to build it. This is part one of a three part series. 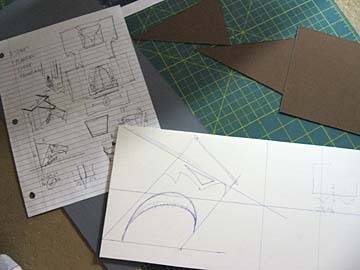 In this, I'm going to cover the idea and planning, part two will cover the construction and part three is the result. This is not a new project for me, I started this a long time ago and some of you may even remember it from way back when. Now you get to see it finished. For those seeing it for the first time, enjoy. The first thing I did was try a little reverse engineering to see if I could figure out a way to build this thing. Lots of sketches and designs later, I had something I thought would work. Below are the complete plans for this thing. If you should try this yourself and find something missing... you'll need to do what I did and just make it up. For those who are curious, the drawings below can be clicked on for a larger version. When I set out to design my version, I wanted it to be something that could be used in games. I knew it wouldn't see much use in things like tournaments or competetive play because of the difficulties it could create. I knew this would be used more in friendly/narrative type games. I made sure to build things large enough for models to be put on them. For example, catwalks are wide enough for 40mm bases, stairs are wide enough for 60mm bases and such. Breaches in walls are large enough for vehicles to get through, that kind of stuff. When I started this, it was never for me, it was always for my FLGS (Game Vault), I could never keep something like this at home... I don't have the space and it would be criminal to keep something like this hidden away for only a few people to use when I decided to bring it out to play on. So with my drawings in hand, I locked myself in the basement and began work. It was the only place in my old house with enough room to lay out the pieces. 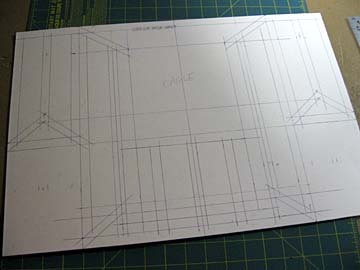 The process of getting the drawings transfered over onto foam board and cardstock took a long time and lots of measuring. It's completely scratchbuilt. There are no Games Workshop bits on it. Not using any bits meant I would have to create a certain amount of detail to make the thing look believable. That was a ton of work in it's own right. It sits on a 5/8 inch thick piece of masonite board. It's made up of different kinds of foam board, cardstock, mat board and textured paper. It measures four feet long by two feet wide. Set it on a regular gaming table and you only have 12 inches all the way around it left over. At it's highest point (the top corners of the eagle roof) it's just over 21 inches tall. It took about 8 bottles of white (PVA) glue to put together and just over a dozen cans of spray paint to paint along with some washes and drybrushing for good measure. Since I had no plans to go from, I spent a good deal of time trying to figure things out in my head before building them. I didn't want to waste materials or time. GW posted some pics a while later showing the construction of their table and cathedral, but those were only slightly helpful in my work since they had access to an endless supply of bits to make whatever they wanted. I was much more restricted in my resources. I'm not sure what spurred me on to building this thing really, I think part of it was the challenge and part of it was wanting to see something this big in real life. The fact that it gets used in games is even better. You're not really in to starting small are you Ron? This is such a brilliant OTT project. I'm pleased as punch your sharing the process. Not that I'm setting out to build anything like it, but the little lessons learned along the way in projects like this are always useful. Very cool. Can't wait to see the results. excellent project, really looking forward to seeing more! These are the types of terrain projects I'd like to tackle once I get my army painted. That's heroic, that is epic in the literal sense! I wish you thumbs up and truly hope you succeed in not only replicating it, but surpassing that goal by a long shot! OMG, I can't wait to see the final pics of this. You sir, are a monster!!! Thanks folks, in the end, mine pales in comparison to the GW version since I don't have the intricate detail. But you can use mine and play games inside of it. Unfortunately, I had to removed a number of elements in order to finish the model. I moved halfway through the construction of this thing and had no where to keep it. Next week will be a handful of WIP shots. After seeing your post on your hobby area (consisting of little more than a smallish desk and a miniature cabinet), I was wondering where you could possibly keeping it. Interesting that you currently own no models, but have one helluva piece of terrain! Excellent Ron, I've been waiting a while to see this mate. Ditto, squared. I love making terrain pieces, and I can't help but stare into the photo lovingly every time I open the Cities of Death book. Are you planning to use the Pegasus Hobbies gothic sets? They have a nice Rose Window wall, as well as some dandy buttresses and columns. WOW, I am really excited to see the next part. Terrain is what I am stating to get into now and it will be cool to see someone else process for building custom terrain. Cool man! I am just doing the same, well not building a custom piece like this but I am glueing together a bunch of different COD sprues with a narrative in mind. 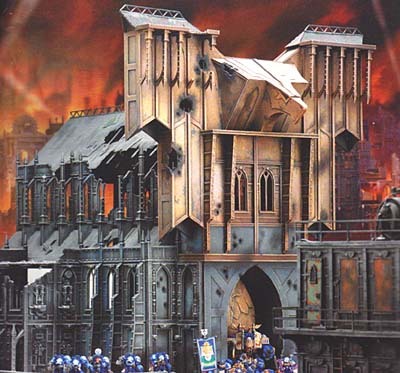 I would like to branch out and do a few scratch built buildings that match the GW aesthetic though once I get a bit more of the base level city done. Can't wait to see more of this done. Wow, I din't think this project would get so much attention. I'm glad you guys are so excited to see it's progress. I'm putting all the WIP shots together for the upcoming post. I'm trying to include just the relevant ones. I took so many that are just pictures of cardstock pieces. We'll see what everyone thinks when they see the WIP and completed model. Your impressions may change. And I say that because like most projects we all have, we start with such lofty goals and sometimes fall short in the end. Either way, it's been a great learning experience for me with building terrain. Love city scenery projects, specially if they are big ones (or modular to make bigger pieces). Sometimes I find funnier to make scenery than minis.